Early in 2009, a group of bus industry professionals met up to discuss the possibility of running a one day service over normally closed military roads to the 'lost' village of Imber on Salisbury Plain, which had last seen a bus service in 1943. 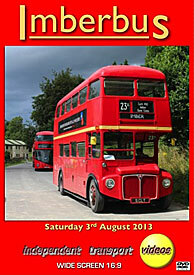 'Imberbus' was thus born, with four Routemasters working the first event in September 2009. Fast forward to August 2013, when the fifth event was held, featuring six Routemasters; RM5 (VLT 5), RM1005 (5 CLT), RMC1510 (510 CLT), RM1978 (ALD 978B), RML2665 (SMK 665F) & RML2735 (SMK 735F) and one New Bus for London LT24 (LTZ 1024) - suitably 'route branded' for the event. Our cameras take you on journeys to exotic sounding places such as Gore Cross and Brazen Bottom, as well as Tilshead, Chitterne, the Lavingtons and New Zealand Farm Camp, whilst the 'core' service operated from Warminster Rail Station to Imber every 30 minutes, with many services needing to be duplicated. A memorable day for everyone!